If there’s one thing that public health professionals talk (and write and meet and tweet) about constantly, it’s healthy eating. This is a high-stakes issue, and it’s complicated — which means that figuring out ways to help folks make healthier food choices can be tricky. Also, as you surely know, access to healthy foods is a major piece of the puzzle. When families who want to eat healthy foods may have trouble getting them, the messaging becomes extra important. But never fear, dear readers, we’ve got tips to help you create compassionate, empowering messages about healthy eating for communities that might be affected by limited food access. Keep things positive. It’s easy to get lost in the land of negative framing when communicating about food access issues. Just take the common public health term for communities where it’s hard to find healthy foods: “food deserts.” Hello, negativity. We prefer to talk about “food access and security” because we want to help families and communities focus on what they can do to eat healthier, not leave them thinking about what they don’t have. Be honest. Know your audience. If transportation is an issue for your community, acknowledge that. If fresh veggies are hard to find, help folks feel understood — like they’re not alone in dealing with this problem. Talking about the reality of food access issues can help build trust and increase your credibility with readers, making it more likely that they’ll read and act on your recommendations. Offer realistic suggestions. When writing about healthy food options, make sure to include tips that are accessible and affordable for your audience. We ❤︎ this MyPlate guide [PDF] for families on a budget — check it out to get ideas for healthy suggestions that won’t break the bank (like buying frozen veggies and fruits instead of fresh). 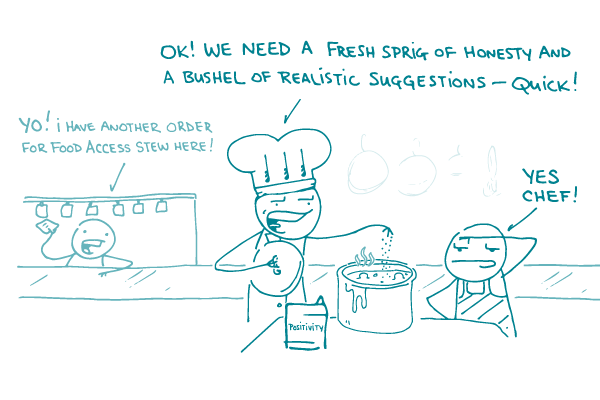 And if you’re including a healthy recipe, make sure the ingredients are things your audience can find. The bottom line: When writing about healthy eating, acknowledge food access issues when you need to — and keep your messages positive and realistic.